Lightly Toasted Pistachios - B said these were pretty good, nothing special, but good pistachios. Toastiness added an extra layer of flavor. Coco Paradise - B was a little worried about the coconut in this one because he's not a huge fan, but he said the craisins and chocolate were great tasting and you couldn't really taste the coconut it just gave it an added texture. He gave this one a thumbs up! Mumbai Masala - B is a huge fan of Indian food, and he loved this one. Said it tasted great and had some great Indian flavors. Eleanor's Apple Crumble - He said it tasted like a dried apple pie, and he liked this one! 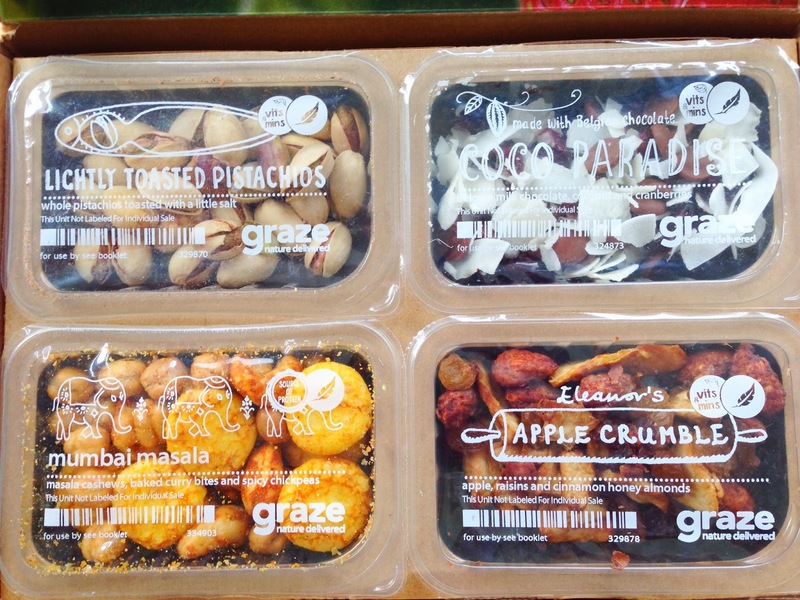 Overall, B seems really happy with the Graze Calorie Counter box, and wants to keep subscribing. He's glad to have some snacks on hand in his bachelor pad, where there's usually very little food, and a lot of takeout being ordered. He's also glad to have snacks on hand for when I visit, because I bug him every time that he doesn't have any snacks around for me!